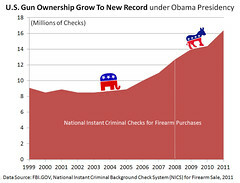 So, if a universal background check (UBC) is passed, and the president decides through executive order to stop processing background checks (or the system is shut down due to budget constraints, or due to natural or man-made disaster), wouldn’t that put a universal gun ban in place immediately? Shouldn’t there be a provision in any bill that if the UBC is shut down for any reason for longer than 4 days, that the law becomes null and void until such a time as the UBC is reinstated? A UBC’s registration criteria should also be immune to political manipulation and tightly controlled. For instance, liberals in Congress would like to define NRA members, Second Amendment Supporters, and all those people who “cling to their God and their guns,” as mentally unstable and therefore subject to a gun ban. Not so far-fetched when Homeland Security decided to include fundamentalist Christians and our military veterans in its identification of potential terrorists! You are really ranting and raving now, letting your paranoia run wild. Come back to Earth, please. No one is suggesting a ban on guns, that is just the NRA radicals trying to gin up opposition to reasonable, common sense gun regulations…like keeping them out of the hands of criminals and nutcases. Nor does DHS consider fundamentalist Christians or veterans to be potential terrorists…just the ones that, like any other terrorist, make terrorist threats! I have no doubt, the way executive orders are being used right now, that someone so devoted to gun bans, would attempt to do through regulation what could not be achieved through law. Consider how D.C. is violating the Second Amendment with onerous regulations, making actual ownership effectively impossible and undermining the Supreme Court ruling. Bloomberg, if he became President, would try it. Christian Reconstructionism is a Calvinist theonomic movement, founded by Rousas John Rushdoony, that some claim has played a role in promoting the trend toward explicitly Christian politics in the larger U.S. Christian Right. Christian Reconstructionists are usually postmillennialists and followers of the presuppositional apologetics of Cornelius Van Til. They tend to support a decentralized political order resulting in laissez-faire capitalism. Sounds powerfully threatening to me. They believe Biblical principles should govern how laws are passed, just like the Founders, who used Black’s Law, filled with biblical justification for the Constitution’s principles.